The Psalms, especially the psalms of David, quicken within us, as does no other literature, a spirit of reverence toward God and worship of God. We would be greatly impoverished without our written record of the psalmists’ inward struggles, their determinations to trust God in spite of circumstances and appearances, and their rejoicings over victories gained through faith. Any Christian desiring deeper fellowship with God and a closer walk with Him will be helped toward these goals in reading the Psalms. 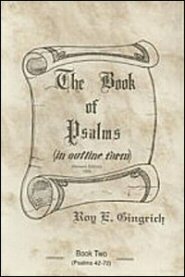 Brother Gingrich’s keen analyses, his concise expressions, and his pointed practical conclusions make these volumes on the Psalms to be full of enlightenment and edification. These volumes, unlike some commentaries, must be used alongside an open Bible – a most commendable feature. © 2019 Copyright Roy Gingrich Ministries. All Rights Reserved.